A while ago, before summer even started I had decided that it was my mission to make some new clothes! This was of course, before I realized I was going to open my company in september. So what had begun as a great beginning to a new closet became just a few additions and a pile of unfinished projects! I was set on starting with a few new blouses and a couple of pairs of shorts. As soon as I can find someone to take my picture, I can show you what came of these little fabric piles! I have the first one of those patterns! I need to improve my sewing skills before being able to use it though...! Its super easy to sew - I hate the type of sleeve facing that they do, so I suggest you just do a little bias trim! 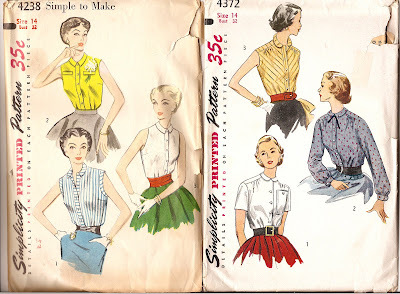 I've made tons of blouses using this pattern! Let me know if you have any questions!